In this second session of NURTUREart’s 2018 residency for new collaborations, artists Anjali Deshmukh and Purvi Shah will explore how we inhabit the sacred through embodied poetics and space design. They ask, in this time of heightened surveillance and criminalization of immigrants and communities of color, how do we create space for ourselves and for beloved community? Drawing upon Hindu concepts of lila (cosmic play) and the feminine divine, the artists will create an interactive experience that engages participants in explorations of home and belonging. 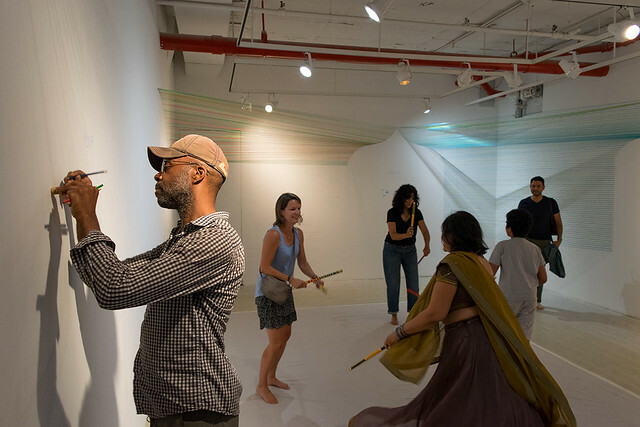 As social practice artists, Deshmukh and Shah delve into art as a tool and process for individual and collective transformation by sparking dialogue, community connection, cocreation, and healing—especially for historically oppressed communities. In prior collaborations, Deshmukh and Shah have created projects that further healing through storytelling, movement, and creation of talismans. Their prior participatory art collaboration, Make Your Self Meek / Make Your Self Vast, explored the relationships between language, mind, social experiences, and the body through physical movement, self-study, and manifesting intentions. Their Pushcart nominated cowritten short story, “Mirrored Women,” reenvisions aspects of One Thousand and One Nights from women’s vantages. Drawing upon poetry from Shah’s forthcoming collection, Miracle Marks, and Deshmukh’s interactive design and games creation, they will deepen their investigation in how poetry and language can be experienced through the body and how to design space that allows for dialogue and healing. What does home mean? How can we belong? How do we create space for ourselves and for beloved community—especially in this time of heightened racism? Drawing upon Hindu concepts of lila (cosmic play) and the feminine divine, together we will explore home and belonging through interactive art. Anjali Deshmukh is an artist, game designer, graphic designer, and writer. Her work is dedicated to building equitable economies and understanding how change—the evolution of self, society, and our built environment—manifests through art. Anjali holds an MFA from the Rhode Island School of Design and is a Fulbright Scholar in Fine Arts. She was named an Award Finalist (2nd Place) for SXSW Eco’s 2016 Place By Design Competition and was nominated for a Pushcart Prize in 2015 for a work of fiction written in collaboration with Purvi Shah. Recent accomplishments include a commissioning grant for public art from the Queens Council on the Arts and installations at the Brooklyn Grange, Brooklyn Museum, Dumbo Arts Festival, Digital Games Research Association, and Propelify Innovation Festival. Anjali currently serves as Vice President at Mission Investors Exchange, an organization working to create equitable economies through the practice of impact investing. Previously, she was Director at JUST Capital and Nonprofit Finance Fund; and an Americorps Vista Volunteer at the Massachusetts Housing & Shelter Alliance. Learn more at 3d.anjalideshmukh.com. Purvi Shah inspires change as a non-profit consultant, anti-violence advocate, and writer. She is curious about language and art as dreamwork for love, transformation, and justice. She won the inaugural SONY South Asian Social Service Excellence Award for her leadership fighting violence against women and has co-led a creative expression workshop, Movement to Power, to confront intimate violence and enable healing. During the 10th anniversary of 9/11, she directed Together We Are New York, a community-based poetry project to highlight Asian American voices and experiences. Recently, she collaborated with Anjali Deshmukh on Make Your Self Meek/ Make Your Self Vast, a participatory art project exploring how we take up space in the world. Her award-winning poetry book, Terrain Tracks, plumbs migrations and belongings while her chaplet, Dark Lip of the Beloved: Sound Your Fiery God-Praise, explores women and being. She serves as a consultant and trainer on gender, racial, and economic equity. Her favorite art practices are her sparkly eyeshadow and raucous laughter. Discover more @PurviPoets or purvipoets.net.